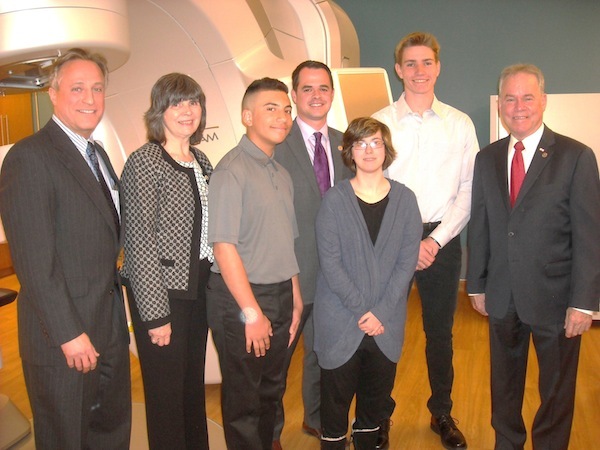 Photo by Barry Warner – (L to R) Dr. Richard Evans, vice president of surgical services; Dr. Mary Leahy, CEO Bons Secours Charity Health System; student Anthony Besmer; State Senator David Carlucci; student Christina Tenore; student Gerrit Stech and Rockland County Executive Ed Day. The new Truebeam Linear Accelerator System is an innovative medical technology that enables a radically different approach to treating cancer with image-guided radiotherapy. More than 300 cancer patients have been treated with the hospital’s new system since it was installed in July, 2017. Breast, prostate, head and neck, gastrointestinal, brain, lung and gynecological tumors can be effectively treated with lower radiation doses.